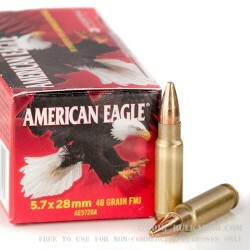 High volume FiveSeveN and PS90 shooters will appreciate the cost savings of this 5.7x28mm range ammo from Federal. The cartridges in this 500-round box possess ballistics comparable to SS197SR hollow-point rounds. Like the SS197SR, this load propels a 40-grain bullet to a muzzle velocity of about 1655 feet per second, somewhat slower than lighter 5.7x28mm loads. To ensure maximum reliability, Federal obtains its 5.7x28mm brass from FN. 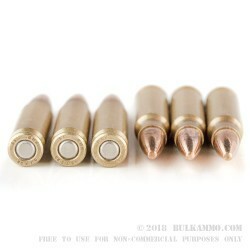 The bullets use a total metal jacket (TMJ) plating method that encases the entire lead slug in copper; this reduces both cost and lead exposure, particularly at indoor ranges. Federal Premium Ammunition produces ammunition to suit range, self defense, and hunting needs at its factory in Anoka, Minnesota. The company enjoys a reputation for above average quality thanks to nearly a century of experience designing and producing ammo. This strong expertise led the US government to select Federal as the operator of the Lake City Army Ammunition Plant, which produces mil-spec cartridges for the US military. Very new gun ownership and all the jargon that comes with guns themselves and variety of ammo. Best Deal in 2 years! Q: Are these comparable with AR-15 platforms? A: Hello Tony! I appreciate you reaching out to us about that 5.7 ammunition. While they do make some AR Uppers chambered in 5.7, the two most common firearms chambered in this caliber is the FN 5.7 and the PS90. If you have any other questions, please do not hesitate to ask!